Zhuhai Hi-Line Electronics is located in the beautiful coastal city—Zhuhai, China. It is a high-tech R&D enterprise dedicated to developing, producing various innovative LED RGB lighting products, LED power supply and intelligent controllers. Our main products include LED RGB digital tube, LED strip light, LED screen, LED solar light, LED power supply and RGB intelligent controllers for led lights. 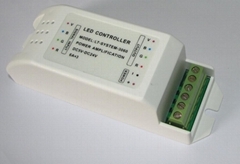 These products are widely applied in municipal projects, casinos, stage lighting, home decoration etc which have been receiving good reputation among many parts of the foreign markets, such as American and European areas, Middle east and Southeast Asia etc. We have been in LED field since 2007; We continuously focus on our tenet “Quality, Honest, Innovative and Efficient”. With experienced R&D team and advanced equipments, we can offer our customers with the most-innovative, cost-effective and advanced decorative led lighting products used for events, parties， home decorations, weddings, exhibitions, business, indoor and outdoor applications. There is no doubt that your satisfaction is our priority mission. We are warmly welcome you to establish win-win commercial partnership with us to exchange valuable information and explore splendid future in the field of LED lighting.